Due out at the end of March is this exceedingly handsome paperback from the Economist, full of smart and informed speculation about the state of the world in the coming mid-century, and also containing two original short stories. One - entitled Ma Ganga - is by the excellent Nancy Kress, and the other - entitled "Visiting Hours" - is by me. My piece takes a speculative look at advances in neuroprosthetic medical technology, springing off from developments already making the headlines. 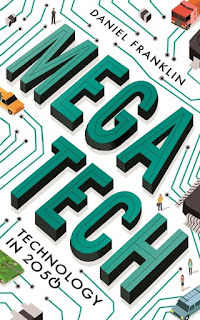 The 242p page book is edited by Daniel Franklin and contains non-fiction contributions from Tom Standage, Frank Wilczek, Melinda Gates, Oliver Morton, and many others. I am very pleased to be among such esteemed company. In 1985 I left home to start my university studies in Newcastle, situated on the chilly, north eastern side of the United Kingdom: about as far from Wales as it's possible to get before you end up in Scotland. Even the Romans got as far as Newcastle before deciding that was about as far north as it was sensible to go. It had not been my plan to go that far up; my hopes had revolved around a degree in Sheffield or - when the former option started looking doubtful - Colchester, both of which involved lengthy but not arduously long journeys. I had in fact been accepted onto a place in Colchester to study laser technology and attained (by a whisker) the necessary qualifying grades. When a place became available on an astronomy degree course, though, I jumped at the chance to study in Newcastle, even though I had never visited the city, not even for the usual university interview. The day I showed up for the start of term was my first time in Newcastle, and I came with as much as I could cram into a single rucksack, which would have been several changes of clothes, a book or two and perhaps a small portable kettle. I almost certainly didn't bring my Sanyo Hi-Fi system, which would have followed a day or two later in a metal shipping trunk sent by British Rail's then Red Star parcels service. Someone kindly helped me collect the trunk from the Red Star depot in Newcastle, and from then on I was able to lead a much more comfortable existence in my student bedroom. By then I had a small but cherished collection of vinyl records, mostly acquired over the preceding three years. I had rarely listened to music in my early teens but by the time I was sixteen it had become an increasingly big part of my life, with regular visits being made to the record shops in Cardiff to stock up on an album or two. Like many such listeners back then, though, I was also an avid compiler of cassettes. Most of the new music I discovered came my way not through vinyl, but through the sharing of tapes between friends. That was fine, because I couldn't possibly have brought my JVC turntable as well as the Sanyo system, so the turntable stayed at home, along with my records, and I made do with cassettes, both pre-recorded and home-taped. On my first or second free weekend in Newcastle, I went down into the town and bought a cassette to listen to. It was an interesting choice, partly because it was a double cassette, but also because it was by a band I knew next to nothing about, and most of whose music I couldn't have named or recognised. I didn't know where the two albums on the cassette sat within that band's output. What I did know, though, was that one of the albums had the song Do it Again on, and that was my sole motivation for buying the cassette. Something about the rhythm and melody of Do it Again, the plaintive, yearning vocal line, sunk its talons into me pretty deeply. I had to have that record, and if the price of that was a couple of Steely Dan albums on a double cassette, so be it. At that point, though, I couldn't have cared less about the rest of that band's output. Within a few listens, though, both albums on that cassette - 1972's Can't Buy a Thrill, and 1977's Aja, had begun to exert a powerful pull on my imagination. I found myself listening ever more intently, sucked in by the lyrics and the amazing arrangements, quite unlike anything else I'd ever heard up until that point. 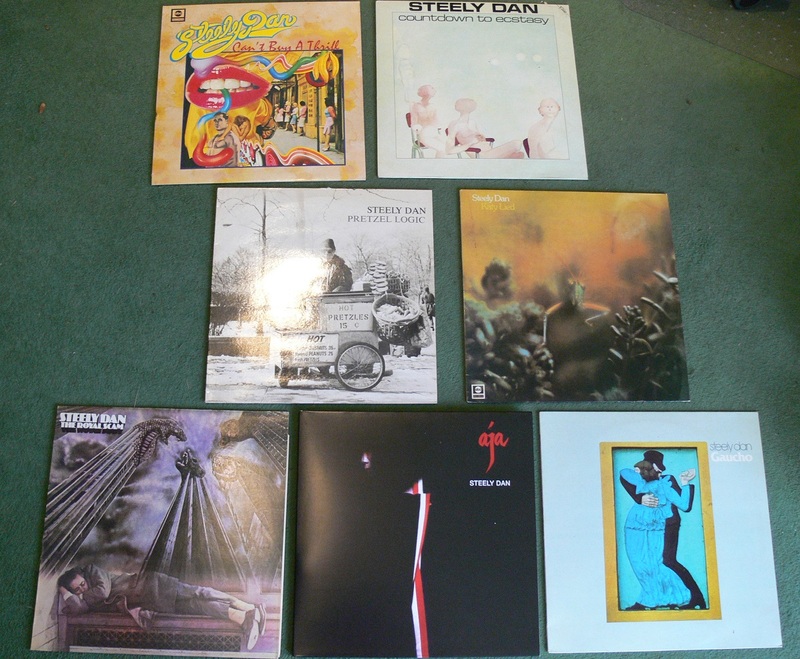 Steely Dan rapidly went from a passing interest, to my number one musical obsession. It was a love affair that would continue right through my student years, but doomed from the outset by a dark, dispiriting realisation: they had already split up. This was 1985; Gaucho, the band's last album, had come out in 1980 - an age ago, or so it seemed at the time. They had made seven nigh-on flawless records and then just stopped. Donald Fagen had recorded one album in the intervening time, but even that was three years old. Walter Becker had been completely silent. This was a bittersweet realisation. I had begun to explore a lush new musical universe - but it was finite, and like a non-renewable resource it must be treated as such. I therefore resolved to limit my purchase of Steely Dan albums as far as possible, delaying the inevitable point when I would have to accept that I had run out of their music. For the rest of 1985, I bought no new Steely Dan material. I was ferociously strict with myself, listening instead to Aja and Can't Buy a Thrill on near-constant turnaround, finding new levels and subtleties in the music. Just trying to figure out the lyrics was a mission in itself. There were no lyric sheets or liner notes with the cassettes. I remember lying in bed, listening to Aja's title track over and over, trying to plumb its mysteries. Holy crap, is he singing "double-helix in the sky tonight"? What the hell is that about? By earlt 1986 I'd cracked, though, and I purchased two more Steely Dan records. These were vinyl editions this time, since I was back home and able to make tape copies of them on my turntable. These records were 1974's Pretzel Logic, and 1976's The Royal Scam. The Royal Scam remains one of my all-time favorite albums, not least because I can still remember the almost unbearable thrill of setting the needle down onto side one, and being blown away in short order by the holy trinity of Kid Charlemagne, The Caves of Altamira and Don't Take me Alive. Again, as per my experience with the first cassette, I had heard next to nothing of theirs before. In any case, they only had one or two "radio friendly" hits and I don't think these were ever part of my formative musical education in the 1970s. Quite simply this music was all new and fresh to me, and wonderfully exciting. Cool and clever, too. Fagen and Becker seemed like two wise older brothers, well versed in the ways of the world. Their lyrics dripped with bittersweet experience, hard-won cynicism, droll observations and exquisite flourishes of detail. It would still be years before I travelled to America, but via the music of Steely Dan, a little part of it began to unfold in my head anyway. I cracked in another, smaller way as well: I bought Fagen's 1982 solo album, The Nightfly. This didn't seem like cheating as it wasn't precisely Steely Dan, and anyway, who knew how long I'd have to wait if I didn't snap it up there and then? It's still one of my favorites, not least because of the gorgeous Asimovian retro-sci-fi head-trip of IGY (International Geophysical Year), in which Fagen puts himself back into his own head as a teenager in 1957, imagining the coming world of 1977, with its wheels in space, undersea trains of "graphite and glitter", and "just machines, programmed by fellows with compassion and vision". My sensors suitably attuned, I began to realise that sci-fi imagery cropped up elsewhere in the Steely Dan catalogue as well. As 1986 wore on my resolve took another falter and I purchased Gaucho, the final Steely Dan album. Received opinion at the time of its release seemed to be that it was a step too far into flawlessly smooth production values, verging on the sterile, but I've always loved Gaucho, for all its studio perfection. In fact it's a hard one for me to pick an absolute favorite out of the final three albums, all of which I think are masterfully good, but it would probably end up being a toss-up between Aja and Gaucho. Far from being anything to do with production techniques, I think what really lifts these final three albums is the presence of the gorgeous female backing vocals, more prominent (to my ears) than on the earlier releases. But the truth is that I love them all, and there isn't a Steely Dan album that you could reasonably call weak. By the end of my student days I had them all in vinyl, with the sole exception of Aja. Fittingly, perhaps, when I recently returned to the occasional vinyl purchase, a beautiful, heavy vinyl edition of Aja was one of my first treats. Although it seemed so at the time, it wasn't really the end for Steely Dan. By 1986, Fagen and Becker were playing together on the same album, although in this instance it was the one and only release of former model Rosie Vela. I bought it because of the SD connection - and it's good, too. Becker got involved with China Crisis, so I bought their stuff as well, and then Fagen put out another solo album, 1992's cyberpunk Kamakiriad. By the mid-nineties they were playing together as Steely Dan again, and another two studio albums were to follow. But by then I was buying CDs, and that's another story. The author's Steely Dan collection, all but one of which was bought thirty years ago.